Because my skin is very sensitive right now and reacts on parabens I would like to choose my skincare as natural as possible. 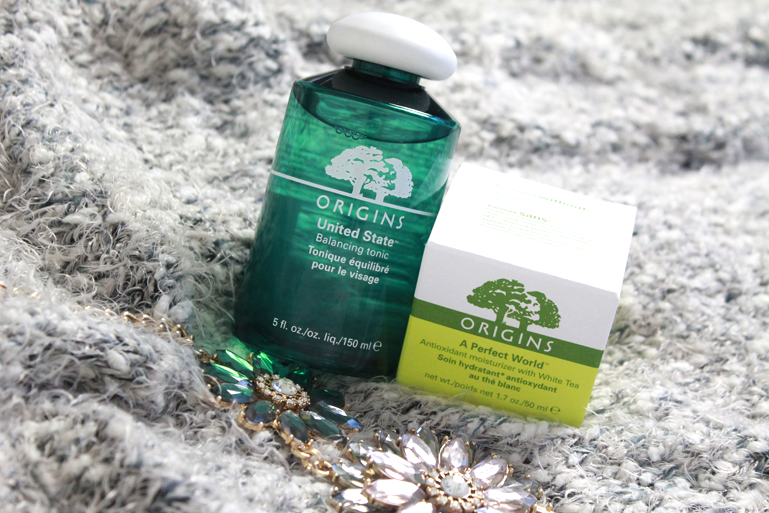 Origins is known about their active plants, 100% natural essential oils and certified organic ingredients. You can get this brand in Holland for a while now and many people (such as beautybloggers) are very enthusiastic about the products. I had tried a few products before but never a day or night creme and I was very curious! To make it complete I thought to try a tonic too. 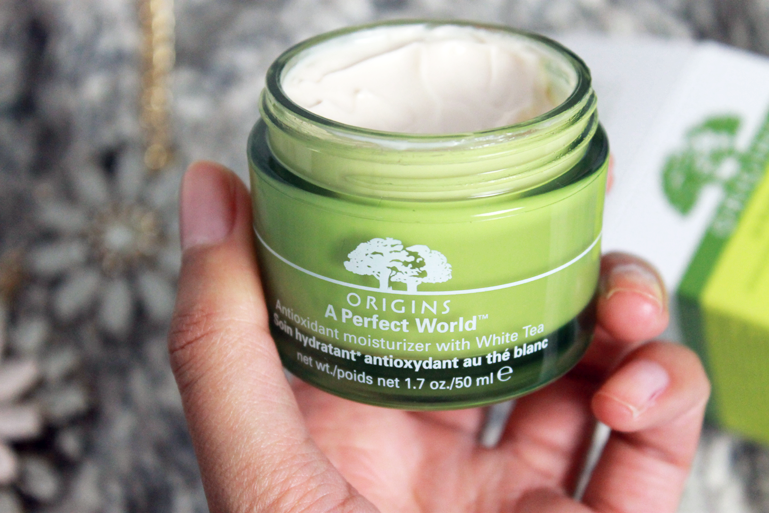 The "A Perfect world antioxidant moisturizer with white tea" is a creme for day an night.
" New research at several major universities has proven that world-famous White Tea is among the most potent antioxidants, anti-agers, anti-stress, anti-smoke, anti-pollution antidotes. 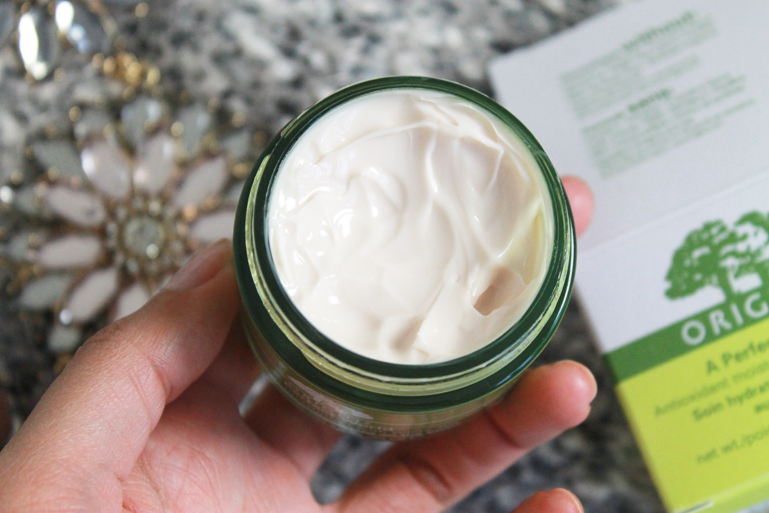 Now its perfect-protective powers are energized and optimized while skin is deeply moisturized. Ferment of Sugarcane acts like a mini-sparkplug to up skin's ability to neutralize free radicals before they deface skin. Murumuru Butter maximizes skin's moisture barrier. Rose Fruit Oil hydrates. Centella Asiatica firms. Vitamin C brightens and helps even out skin tone. And aromatic Orange, Bergamot and Spearmint fortify the feel-good factor. Keep your skin in A Perfect World™ 24/7." When you open the jar you can smell the fresh oranges that gives you energy right away! The creme is a bit on the creamy, rich side but that's what I need for this season. It doesn't' layer on the skin but it pulls in to te skin perfectly. I can honestly say the last week my skin had this fresh energizing glow what I really love! And I can apply my foundation over it without any trouble.
" This tingly-cool, retexturizing tonic is dedicated to the proposition that all skins can be created equal. Origins state-of-the-art exfoliators slough the flakes, sweep pore clogging debris and smooth rough spots. Laminaria de-shines T-zones without stripping or stinging, and Soy Protein protects moisture levels to prevent parching. 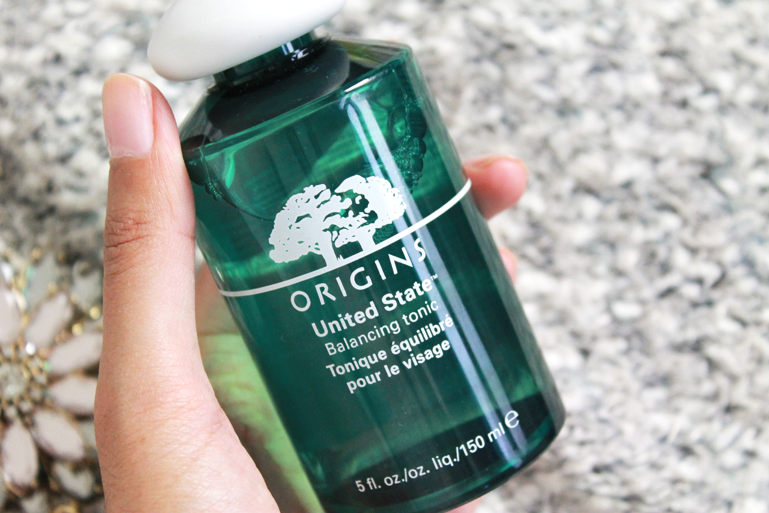 Disunited dry and oily areas come comfortably together as one - refreshed, refined, rebalanced. Reinstates skin's proper pH too for a user-friendly feeling. There's also aromatic Bergamot, Spearmint and Lavender to add pleasure to the process. When I first open the bottle and put some tonic on a cotton pad, the fragrance is bit heavy and chemical. That could scare of a little but when u use the products all the worries go away. It closes the pores and that's exactly what I need especially around the nose and cheeks area. My skin is also a lot less red. So balancing for sure! 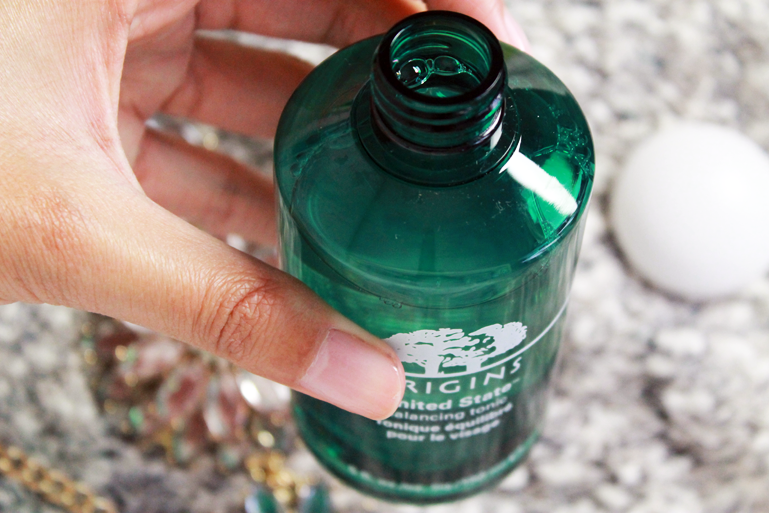 What are your favorite skin care products from Origins? I reed a lot about the drink up mask so I might try that out sometime!